Saying goodbye to two of the hospice nursing team members as she “graduated” in March. I sit in a hospice family room this afternoon, hearing the raspy breathing of my mother in the other room. We’ve already been through this once when back in January she was placed in hospice for palliative care because of uncontrollable seizure activity. After a two month stay, she improved enough to “graduate” to assisted living. In one way this was a step-down from her earlier independent living, but it was two steps-up from hospice. She adjusted well, but the seizure activity began again, resulting in a nursing home placement for 10 days. She showed some improvement with rehab but with another round of seizure episodes, she was ready to return to hospice for tender loving care, almost exactly three months from her previous discharge. We were grateful for those three months. It allowed us to celebrate her 95th birthday (see Celebrating the Gift of Our Matriarch); she made new friends and caught up with a few old ones, who had moved from her retirement apartment to assisted living; and, she got to meet her newest great-grandchildren, my daughter’s twins. Additionally, she continued to serve the Lord through her witness of faith in church and community. I am on a rotation of ministers who go to the nursing homes, and though I usually accompany myself on the guitar when we sing hymns, she played the organ for me at assisted living while she was a resident. It was nice to have her play for me one last time. Mom was a music teacher. A graduate of Grinnell College in Iowa, her first teaching assignment was in Seymour Iowa, where she taught music. It was there she met my dad, who taught business classes in the high school. He joined the Navy in 1943, and they were soon married. She never taught school after that, having begun to raise a family of five, four daughters and a son. However, her music training was not wasted as she sang in church choirs and ensembles and played piano and organ in a several churches. Additionally, she supplemented the family income by giving private piano and voice lessons in our home for a number of years. Almost every day, I came home from elementary school to hear the sound of inexperienced pianists playing their scales and struggling through simple songs. Oh, oh, oh, oh, Oh, you beautiful doll! I’m sure I would have been a YouTube sensation if it had been around in 1961. “Bunny” giving a great-granddaughter a piano lesson. And so life goes. We prepare for the death of our “great big beautiful doll” of a mother, for whom our hearts will ache when she leaves. However, we know that we will sing together with her again as we look forward to the fulfillment of our hope in Christ Jesus and His promise of eternal life. 2 Dear friends, we are God’s children now, and what we will be has not yet been revealed. We know that when He appears, we will be like Him because we will see Him as He is. 3 And everyone who has this hope in Him purifies himself just as He is pure. When my wife and I were married almost 38 years ago, we had a jeweler place diamonds from her grandmother’s ring in both of our wedding bands. Believing that Christ was to be the central part of our relationship as husband and wife, we chose to have the symbol of his sacrificial love – the cross – as a constant reminder of the type of love we should have for one another. Because I lost my band about 25 years into our marriage, I wear what we felt was a suitable replacement; a band that has three crosses and diamond chips. 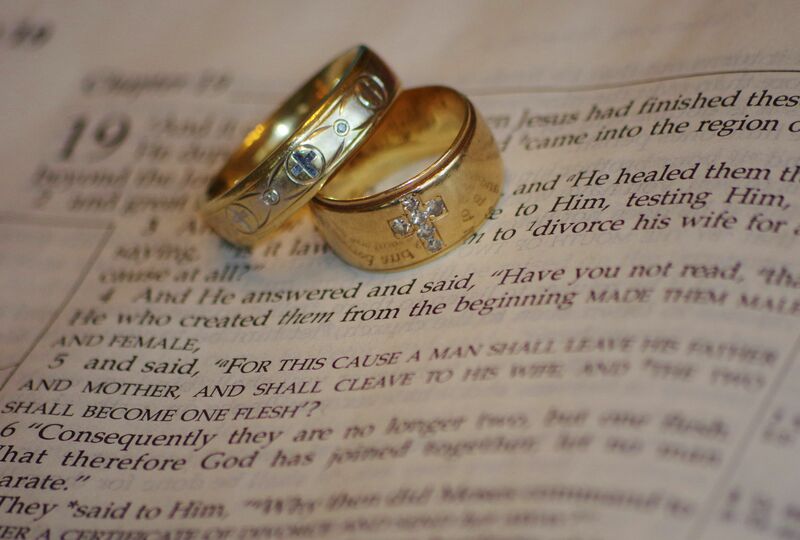 Though we now wear different styles of bands, the common symbol of the cross serves as a reminder of God’s significant role in our lives as individuals and as a couple. Celebrating the Gift of Our Matriarch! Those of you who read my daughter’s post, “To Our Beloved Bunny,” know that my mother (aka “Bunny” to her grand and great-grandchildren) was in hospice care, following a severe seizure episode in early January. What I haven’t reported is that she graduated from hospice this month and is now in an assisted living residence. Today, she celebrated the milestone of her 95th birthday. I am glad to say that while not totally back to her old self, she has her humor, enjoys socializing with other residents, reads, watches Netflix (British crime mysteries her favorites), and is back to church. What do you give a 95-year-old for their birthday? While Mom was doing well in December, my wife launched a plan for a unique birthday gift…a charm necklace. On New Year’s Eve, I put the idea out to the family on Facebook Messenger with the suggestion that her children and grandchildren supply a charm that in some way typified each one’s unique relationship with their mother/grandmother. While there was a hiatus in the planning once she went into hospice, charms began arriving when it became clear that we would indeed celebrate this special birthday. This morning, we gave her gift. The oldest granddaughter, who gave Mom the “Bunny” moniker, supplied a bunny charm. My daughter, influenced by Mom’s piano skills, gave a grand piano charm. The funniest charm is a set of false teeth that open. Mom had a knack of amusing the grands and greats by dropping her false teeth and protruding them from her mouth. The most poignant is a girl’s silhouette, representing a granddaughter who died at age 26 in a drowning accident. From a poodle to a camper, each charm brings back special memories of time we’ve spent with Bunny. Mom’s spiritual life as a faithful follower of Jesus Christ has been an example to many and she continues to be a witness of His grace (gift of salvation) to others. For that reason, my contribution was a Bible charm, a book that is dear to her as she has read, studied, applied and taught it for years. Postscript: Here is a rundown of the current charms not already mentioned (I’m sure more will be added). Hummingbird – Hours were spent watching these tiny birds at my parents’ feeders at their home on Kentucky Lake. Camper – Our family camping history began in earnest when my dad took a guest professorship at Central Washington State University the summer of 1967. Three of the five kids accompanied the folks on that two week trek to Washington, pulling a new Apache tent trailer. It slept four, which meant I slept on the floor anytime we camped. We camped all over the northwest that summer and made some great memories. My parents eventually graduated to an Airstream and a motorhome, but I always preferred the “roughing it” years. Washington State Ferry– That summer we traveled by ferry on the Puget Sound several times. That was my first time to be on board any boat that size. Jackrabbit/Grand Canyon – On our return trip that summer we took a southwest tour and spent three days at the Grand Canyon. I’ve not been back, but have an upcoming trip I hope to share with you. Hersey Kisses – We are a kiss on the lips family…sloppy and wet…deal with it. Poodle – Mom and Dad owned two toy poodles, Gidget and Ginger. These were their dogs after the we kids were grown, and they traveled with them, so the grandkids got to share in the memories of these special pets. Tractor – One of the sibling’s family farmed so there were lots of visits to this farm in NE Arkansas. Book – Mom, a former librarian, is an avid reader and maintained the library at the senior apartment in which she formerly lived. Dolphins – Our favorite vacation spot is on the panhandle of Florida where our family has been gathering every October since the mid-80’s. We have always enjoyed spotting the dolphins trolling near the beach. Sand dollar – Our favorite beach once had sand dollars the size of your hand. Now, your lucky to see them the size of a dollar coin, which the name implies. Quilt – Bunny made a wedding quilt for each of her grandchildren. Thus, a very tangible treasure for each of the 16. Tennessee – Though having been born in Iowa and living here now, Mom lived the majority of her adult life in Tennessee. Cooking Utensils – Well, it goes without saying that we like to eat, and Mom ran a good kitchen! Heart – A contribution of a red heart charm seemed appropriate to fall in the center of all the charms. While I’m sure the grandson who gave it had the idea of love in mind, I think it can represent three things: 1) our love for Bunny; 2) her love for her family and others and; 3) God’s love for us that he demonstrated through the death of his Son, Jesus, whose blood was shed for the forgiveness of sins. Michelle W. issued this week’s challenge with multiple options. I chose to “highlight a new person in your life, and all the possibility that relationship contains.” More accurately, it is new “persons.” My oldest daughter gave birth to twins (her third daughter and first son) last week and we were able to see the New Year in with them. We feel so blessed that my daughter had a wonderful pregnancy and was able to carry the twins to 37 weeks, allowing the babies to be fully developed and needing no time in the NICU. If fact, they were able to go home 36 hours after delivery. As to the hopes and possibilities that these new relationships hold, I can hardly do better than what my daughter wrote in a post on the Fort Worth Moms Blog of which she is a regular contributor. For you, I don’t desire that you be the most popular, the most athletic, the most beautiful and talented. Because those things, little boy and little girl, are fleeting. My last borns, there are better things if you want them. For you, my third girl…I pray that your sisters and your brother will be your best friends on Earth, as your dad and I are best friends with our brothers and sisters. I hope that you will dance to the beat of your own drum and remember that YOU have been uniquely created to grace this world the way you are. When people compare you to your big sisters, don’t listen. You are YOU. You are not them. When your friends are chasing after boys, I hope you remember that if a boy is worth it, he’ll chase after you. You don’t ever need to play dumb or pretend to like sports or worse, give your body away when you don’t want to. Wait for a guy who is like your dad: valiant, good, smart, and funny. Don’t settle for anything less. It’s worth it. I promise. When you choose a career someday, follow your heart-even if it lacks prestige or money. It’s ok to be adventurous and do the things no one thought you could do. You come from a long long line of determined women. You are able, baby girl. For you, my only boy. I never knew I wanted a boy, until I saw you dancing around on my first sonogram. You looked like nothing more than a little pea, but I knew in my spirit, you were my boy, and that made me happier than you will ever know. I pray you are strong and confident; you’ll need to be with those three crazy big sisters. I pray that you’ll look after them, even though they are older. You will learn young that we women, can be sort of crazy…sort of emotional, and so you will foster the art of compassion. It will serve you well all of your days. I pray you will pursue truth and justice and respect and that you will be a strong force of goodness in this family and in our world. And that you and sweet baby sister will be the best of friends for all of your days. I cried one day thinking about the woman you will someday marry. Choose wisely. Choose a woman who is strong and smart and not afraid to speak her mind. It will be hard, but it will be worth it. Work in a job that makes your spirit fulfilled…no matter the paycheck. Do what you love. It has become my tradition to take a picture of each of my newborn grandchildren with them grasping my thumb. With the exception of our grandson, who died at birth last summer, the tradition has continued with the twins. The grid below represents each of our six grandchildren, beginning almost five years ago. The pewter hand represents our grandson, who was about the size of the 1 lbs, 6 oz child, whose hand was the model for the key chain that promotes the Children’s Miracle Network Hospitals. Humanity is perhaps at its highest when it moves beyond selfish pursuits and comes together to care for the needs of others. Last spring, our church helped coordinate a community-wide “Mobile Hunger Fight” sponsored by Meals from the Heartland of Des Moines, Iowa, USA. Since 2008, the faith-based organization has packaged over 40 million meals for the hungry in Iowa and around the world. With over 150 volunteers from churches, schools, businesses and health-care facilities, the event packaged over 60,000 meals. Creston High P.E. class making boxes. Crest Baptist Church team (always a “ham” in the group). The routine: measuring, pouring, bagging, weighing, sealing, and boxing. Click HERE for more examples of humanity.